The Monkees were, however, exerting more control over their brand new career. Musical Director Don Kirshner would soon be fired and The Pre-Fab Four would have more say over what material they recorded as well. 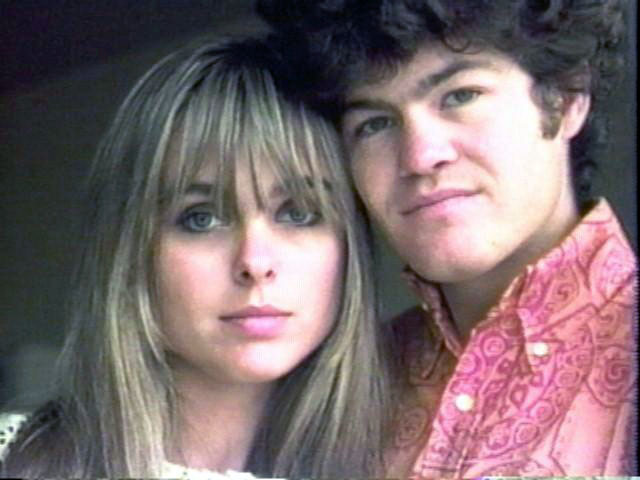 Micky Dolenz often made the statement that they were hired as actors to PLAY musicians. The fact that they also had some singing talent was a bonus. But this would be like telling Mannix to use a real gun and hunt down criminals in his spare time … or Captain Kirk to fly a spaceship. Once these guys left the set, they were done for the day … but The Monkees would be whisked right from the television studio over to the recording studio to add their voices to some prerecorded tracks … and then out on the road for concerts on the weekend. They had to BECOME the characters they played on TV. Michael and Phyllis Nesmith spend the night at John and Cynthia Lennon's home in Weybridge where John plays them some unfinished tracks from their forthcoming "Sgt. Pepper" alum. Sammy Davis Jr. is the host on tonight's episode of The Hollywood Palace. He performs his hit "What Kind Of Fool Am I" along with "Birth Of The Blues" and "The Lady Is A Tramp" but there are no pop or rock acts on the bill this evening. 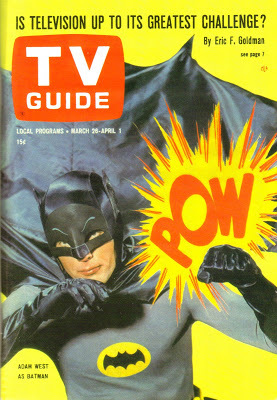 This week's edition of TV Guide features an interview with Adam West, riding high thanks to the INCREDIBLY popular new camp television series "Batman". (Little did he know back then that he would be typecast for the majority of the rest of his career!) He'll appear again a month from now as the cover story (see below). The issue also offers a spotlight feature on television's newest super hero, "Mr. Terrific". 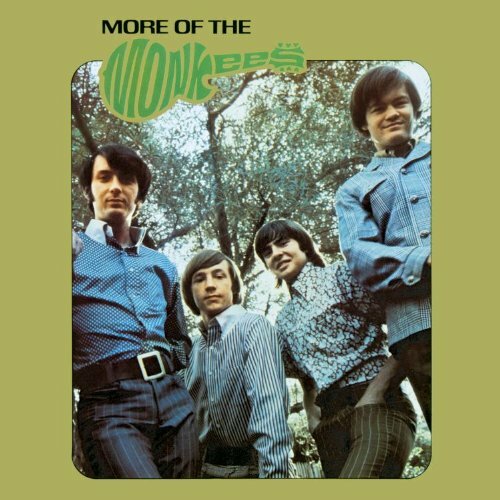 Billboard Magazine reports that Monkees album sales have now passed six million copies and singles sales now exceed five million copies. "Darling, Be Home Soon," the ninth chart single by the Lovin' Spoonful, made its debut on the Billboard Hot 100 on February 11, 1967. Lovin' Spoonful member John Sebastian wrote the song, which was on the soundtrack of the Francis Ford Coppola motion picture "You're A Big Boy Now," and Erik Jacobsen produced the session. The song peaked at No. 15, and remained on the chart for eight weeks. "The Lovin' Spoonful was truly the first American band in post-Beatle America that was not seeking to imitate the English sound," Sebastian said in the Lovin' Spoonful chapter in the e-book version of the book "Echoes of the Sixties" (http://www.editpros.com/bookshelf/echoes_ebook.html) by Marti Smiley Childs and Jeff March. Under the direction of Producer George Martin, the orchestration (performed by a 40-piece orchestra) is added to the new Beatles' track "A Day In The Life". Martin later commented that when he told some of Britain's finest musicians to play 24-bars of "cacophonous, improvised crescendo" they all "looked at me as though I were completely mad." Martin gave the following instructions and criteria to the orchestra: "Start very quietly and end very loud; start very low in pitch and end up very high; and make your own way up the scales, independent of your neighbour." Crazy at that sounds, it actually worked … and this type of orchestral "build" has been copied and imitated numerous times since. They were recorded four times, utilizing all four tracks of their tape machine, which was later mixed down to one track, thus creating the equivalent of 160 musicians playing at once. At The Beatles' request, the orchestra members were asked to wear "full evening dress" … photos were taken at the session of orchestra members in tuxedos wearing funny hats. One violinist wore a red clown's nose and another had a fake gorilla's paw on his bow hand. Also present for this momentous occasion were Mick Jagger and Keith Richards of The Rolling Stones, Michael Nesmith of The Monkees (Micky Dolenz had been there a couple of days earlier when The Fab Four worked on another John Lennon track, "Good Morning, Good Morning") and Donovan. Meanwhile, an obviously smitten Micky Dolenz cancels his plans to fly into Berlin, Germany, in order to spend a few more days in London with Samantha Juste. Here is a song that performed pretty well here in the City of Chicago in February of 1967 ... certainly better than it did nationally ... and one of my favorites by The Association. This week's biggest premiers include "Pucker Up Buttercup" by Jr. Walker and the All-Stars, which debuts at #70, "There's A Kind Of Hush", the latest by Herman's Hermits, entering the chart at #77, "Darling Be Home Soon" by The Lovin' Spoonful, coming in at #80, "I Think We're Alone Now" by Tommy James and the Shondells, which debuts at #84 and "Happy Together", brand new by The Turtles, and sitting in the #89 position. The Beatles begin recording "Fixing A Hole" for their upcoming "Sgt. Pepper" album. 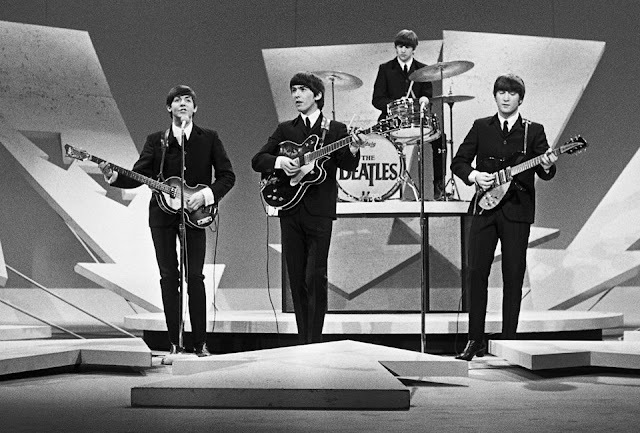 Exactly three years earlier they made their debut on The Ed Sullivan Show. 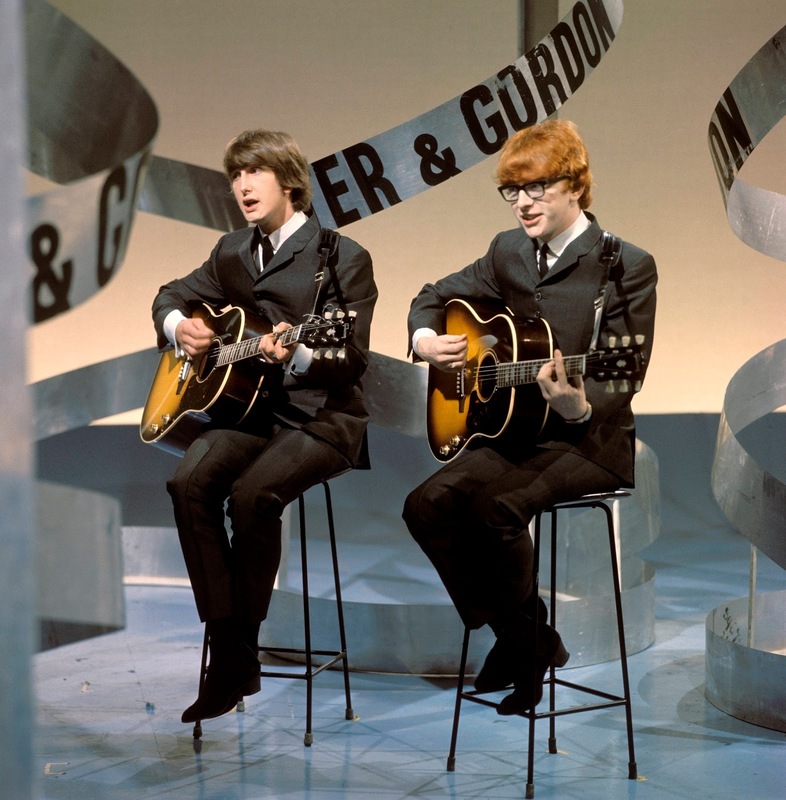 That night they performed "All My Lovin'", "Till There Was You", "She Loves You", "I Saw Her Standing There" and "I Want To Hold Your Hand", their first hit here in America. The complexity of their "Sgt. Pepper's Lonely Hearts Club Band" album (and their most recent releases, "Rubber Soul" and "Revolver") just proves again how much the group had grown in just three short years. It was nothing short of a light year's evolution. Micky Dolenz and Michael Nesmith appear on Britain's "Top Of The Pops" where they are presented by deejay Jimmy Savile with a silver disc award for outstanding sales of their latest record "I'm A Believer". Micky invites "Top Of The Pops" hostess Samantha Juste back to his hotel suite for dinner, where Spencer Davis is also present. Later the couple will go back to The Bag O'Nails with singer Sandie Shaw. Sopwith Camel are back on "Where The Action Is" performing their hit "Hello Hello". The B-Side of the new Herman's Hermits record, "There's A Kind Of Hush" / "No Milk Today", would also chart here in America, ultimately peaking at #29, despite being a #1 Hit in many other countries around the world where it enjoyed A-Side status. (This in and of itself is quite surprising as Herman's Hermits recorded some GREAT B-Sides along the way ... and this was the era of the two-sided hit.) Also deserving of recognition would have to be "I Gotta Dream On", one of my all-time favorites by them, A-Side / B-Side or otherwise, "The End Of The World", which not only received a fair amount of airplay back in the day but is STILL one of Peter Noone's favorites ... and a song he performs nearly every night in concert, "Sea Cruise", the old Frankie Ford hit from 1959, "Walkin' With My Angel", a cover of the Bobby Vee tune, "Got A Feeling", "Hold On! ", the title track to one of their films, "Traveling Light" and "What Is Wrong, What Is Right". Back home in Jolly Ol' England, "No Milk Today" was released as a single in its own right in October of 1966 ... four months before "There's A Kind Of Hush hit the British Chart. It rose to #7 in the U.K. and, in Peter Noone's own words, is one of his favorite Hermans Hermits recordings. (He told me "No Milk Today" is the PERFECT Hermits record.") We talked about this during one of our Forgotten Hits interviews several years ago. kk / FORGOTTEN HITS: The only "charted" Herman's Hermits' B-SIDE here in America was "No Milk Today", which was a BIG hit in its own right in Great Britain ... it's also one of my all-time Hermits favorites. Would you have preferred that this was released as a single on its own here in the States? PETER NOONE: "No Milk Today" was Herman's Hermits' best single and was put together by John Paul Jones, Mickie Most and me with Keith and Karl doing the backgrounds. It was our biggest selling record worldwide and was a B-side in the US because some boy band covered "There's A Kind Of Hush" and put it out in Ohio so we were afraid the radio wouldn't play "There's A Kind Of Hush" by us and we threw away No Milk in the US. PETER NOONE: "No Milk Today" became a B-Side because Mick most didn't actually like the song that much. It had been turned down by The Hollies so he thought it had something missing. Personally I think it is Herman's Hermits best recording, and perfectly captures the moment and the feel of Manchester terraced houses and what was the end of a British era. I recall it was made at Lansdown studios and that we recorded a few other songs that day ... probably "There's A Kind Of Hush", "Dandy" and "No Milk Today". This was in the period where we (Mick and I) had just stopped using The Hermits on the recordings and were using the best musicians available to us to try to keep up with what had suddenly become The British Invasion. We were supposed to deliver 48 tracks a year to MGM so we were always scrambling to catch up. I recall that John Paul Jones played bass guitars (an upright and a fender bass) on the tracks and was also responsible for the arrangements which I dare say are brilliant on all three tracks but I know he liked No Milk Today and I would suggest that his arrangement turned this perfect Graham Gouldman song into a hit. I think that after we had the tracks down then I did the lead vocal and then Karl Green, Keith Hopwood and I did the backgrounds, the songs were mixed and that was it. I hope I am not rambling on too much , but i am happy to have this opportunity to state the facts as to who played what and when on our records. The Beatles begin recording "Good Morning Good Morning" for their upcoming "Sgt. Pepper's Lonely Hearts Club Band" album. John Lennon (who wrote the song) said he was inspired by a corn flakes commercial he saw on tv one morning. It was his idea to add the animal sounds at the end of the record … and he instructed Engineer Geoff Emerick to arrange the animal noises so that each animal heard was capable of devouring (or at least frightening) the animal preceding it. One cool effect that just happened to work was the chicken squeal at the end of the record leading right into the opening note of the title theme's reprise. Monkee Micky Dolenz was present for this session. Later that evening, Micky and Paul McCartney will meet Mike and Phyllis Nesmith at The Bag O' Nails club in London. Elvis buys Twinkletown Farm in Mississippi and renames it The Circle G (for Graceland) Ranch. For the past several weeks he has been on a horse-buying spree, purchasing over a dozen horses for himself and his ever-present posse. Within the next three weeks he will purchase more than two dozen pick-up trucks and other vehicles for use on this new ranch. 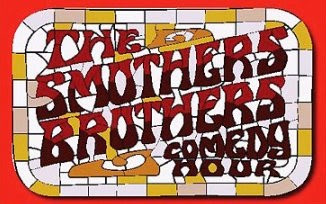 The Blues Magoos are back on "Where The Action Is", performing "We Ain't Got Nothin' Yet", along with Jimmy Castor, who does his new hit "Hey Leroy, Your Mama's Calling You". 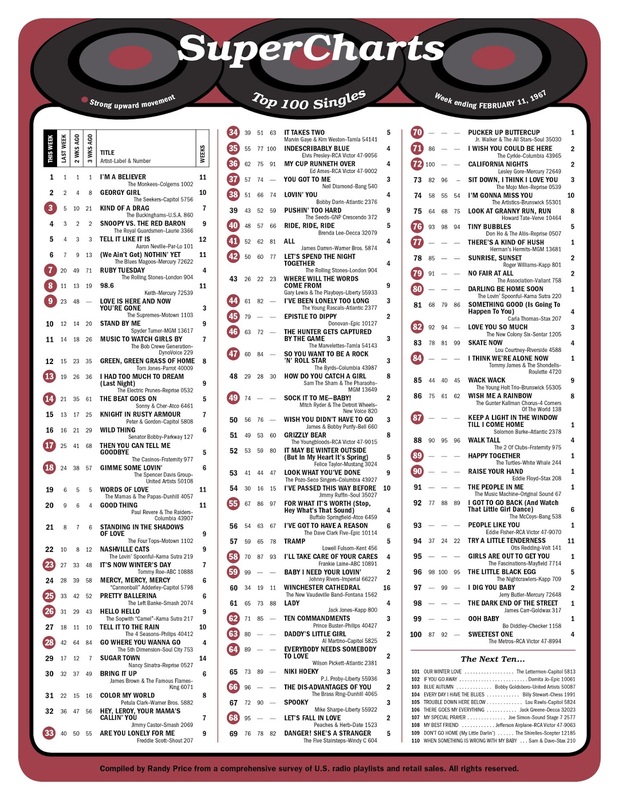 Other hits climbing the chart this week (all with bullets) include "Baby, I Need Your Lovin'" by Johnny Rivers, the biggest mover of the week, climbing forty places from #99 to #59, "Epistle To Dippy" by Donovan, up 34 points from #79 to #45, "The Dis-Advantages Of You" by The Brass RIng, up thirty spots from #96 to #66 (and popular on TV right now in a Benson and Hedges cigarette commercial), "California Nights" by Lesley Gore, climbing 28 spots from #100 to #72, "Let's Fall In Love" by Peaches and Herb, up 27 spots from #95 to #68, "Sock It To Me Baby" by Mitch Ryder and the Detroit Wheels, jumping 25 positions from #74 to #49, "I've Been Lonely Too Long" by The Young Rascals, up 17 places from #61 to #44, "The Hunter Gets Captured By The Game" by The Marvelettes, also up 17 places from #63 to #46, "So You Want To Be A Rock And Roll Star" by The Byrds, climbing 13 places from #60 to #47 and "For What It's Worth" by The Buffalo Springfield, up a dozen spots from #67 to #55. After several successful hits "down under" in Australia, The Bee Gees move to England in pursuit of a worldwide career. Teaming up with Robert Stigwood (then a protégé of Beatles Manager Brian Epstein), The Bee Gees will breakthrough with their first global hit a few months later when "New York Mining Disaster, 1941" hits the charts. 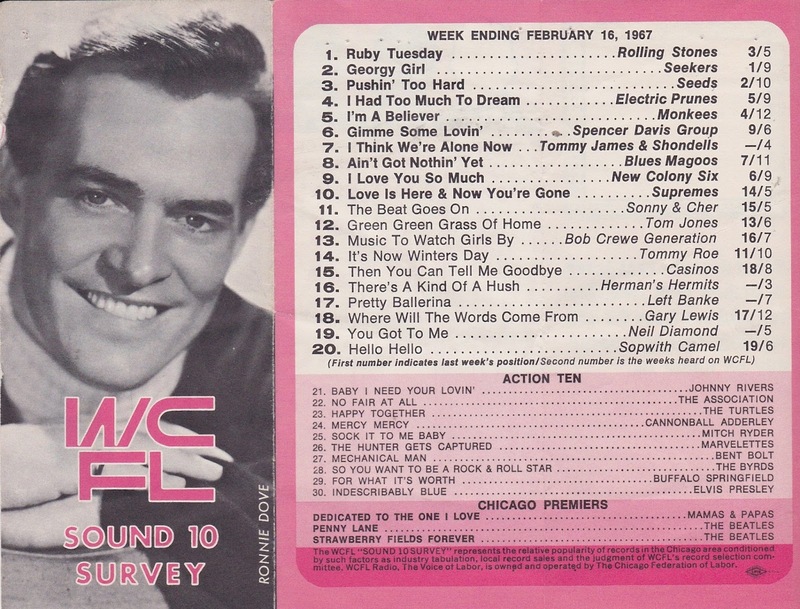 Nine more National Top 40 Hits will follow in the '60's before the band splits up, reunites and scores back-to-back #1 Records in 1970/1971 with "Lonely Days" and "How Can You Mend A Broken Heart". A few years later they update their sound to take on a more R&B edge and, in the process, help launch The Disco Era. Their incredible soundtrack to the motion picture "Saturday Night Fever" propels them to become the biggest recording act of the '70's, an INCREDIBLE feat when one considers that before the first single from the film, "How Deep Is Your Love" is released they have already hit the pop charts 33 times! The sound of driving over a rickety bridge provided the inspiration for "Jive Talkin'" in 1975, Barry discovered his falsetto and the rest, as they say, is history. Between 1975 and 1979, The Bee Gees would have eight more #1 Hits: "Jive Talkin'" (1975); "You Should Be Dancing" (1976); "How Deep Is Your Love" (1977); "Stayin' Alive", "Night Fever" and "Too Much Heaven" (1978); and "Tragedy" and "Love You Inside Out" (1979). Micky Dolenz appears on the British BBC program "24 Hours" where he is asked by interviewer Cliff Michelmore "Does it worry you that you are, in effect, a manufactured pop star?" Dolenz replies (without a moment's hesitation), "No, not a bit, because we weren't. I was discovered going to school, L.A. Trade Tech. Mike was discovered in The Troubadour singing to 15 people every night. Peter was discovered in Greenwich Village singing to two people every night. And Davy was discovered trying to get a job singing to anybody in L.A. Yes, we were discovered. No, we're not a manufactured group." Later that evening he will catch The Spencer Davis Group at The Marquee Club. "Where The Action Is" features performances this afternoon by Neil Diamond ("You Got To Me"), Tommy Roe ("It's Now Winter's Day") and The Standells ("Dirty Water"). Man, I'd love a copy of THIS show!!! Johnny Rivers performs on "Where The Action Is" along with his new protégés The Fifth Dimension. 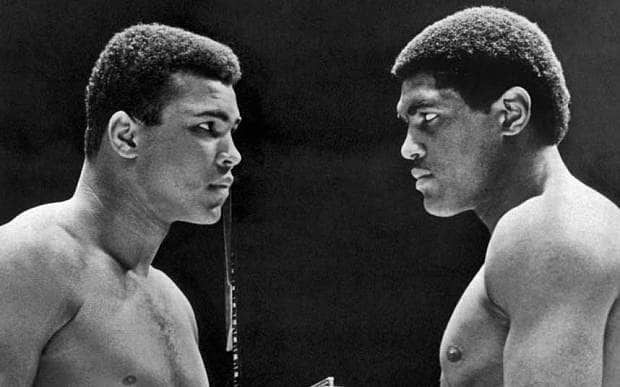 Muhammad Ali TKO's Ernie Terell in fifteen rounds to retain the Boxing Heavyweight Title. 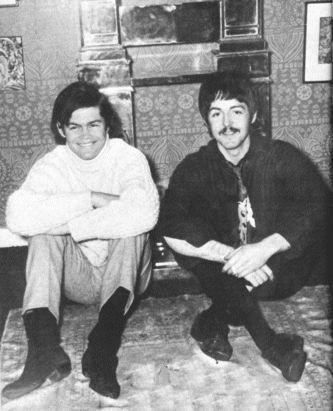 Micky Dolenz arrives in England where he will hang out with Paul McCartney for several days. He will also meet his future wife, Samantha Juste, on this trip. Mike Nesmith and his wife Phyllis will fly there this evening and arrive the following day. Two big movers join The Top Ten this week as "Ruby Tuesday" by The Rolling Stones leaps from #20 to #7 and "Love Is Here And Now You're Gone" by The Supremes climbs all the way from #23 to #9. Also new in The Top Ten this week are "98.6" by Keith (#8, up from #11) and "Stand By Me" by Spyder Turner, which now sits at #10, up from last week's showing of #12. New Top 40 Hits include "Go Where You Wanna Go" by The Fifth Dimension (#28, up from #42), "Indescribably Blue" by Elvis Presley (#35, up from #55), "My Cup Runneth Over" by Ed Ames (a big leap from #62 to #36), "You Got To Me" by the previously mentioned Neil Diamond (#37, up twenty points from last week's #57 position), "Lovin' You" by Bobby Darin (#38, up from #51), "Pushin' Too Hard" by The Seeds (#39, up from #43) and "Ride, Ride, Ride", a comeback record of sorts by Brenda Lee, which jumps from #48 to #40. Fleetwood Mac's "Rumours" album would log 31 non-consecutive weeks at #1 in 1977. Michael Jackson would best that with a 37 non-consecutive week run at the top in 1983 with "Thriller". Prior to The Monkees' 1967 achievement, Harry Belafonte logged 31 non-consecutive weeks at #1 in 1956 with his album "Calypso". Two years later the soundtrack to "South Pacific" also spent 31 non-consecutive weeks at #1. The all-time record for weeks on top of Billboard's Album Chart belongs to the movie soundtrack to "West Side Story", which spent an incredible 54 weeks on top of the chart. (These were also non-consecutive weeks). The Monkees were not at all happy with the release of their second album. In fact, they didn't even know it was out until they saw it in the stores! They hated the cover photograph (essentially a J.C. Penney's clothing ad!) and the fact that they had absolutely no creative input into the album's contents. This would eventually cause an explosive confrontation with Musical Director Don Kirshner, ultimately leading to his dismissal from this position. Micky Dolenz, Davy Jones, Michael Nesmith and Peter Tork are all in New York City today. Micky will go shopping in Greenwich Village and take a walk thru Central Park before deciding it was too difficult to enjoy himself with the massive crowds surrounding his every move. He will fly to London this evening. Davy Jones will also leave New York City tonight for a flight to Nassau in The Bahamas. Peter Tork will visit some of his hold haunts in The Village and Michael and his wife Phyllis will relax before departing for London themselves the following day. The Beatles begin filming their promotional film for their new single "Penny Lane". (They completed the one for "Strawberry Fields Forever" the week before.) Today they are filmed riding horses and walking around Angel Lane in Stratford in the East End of London. They would complete the video on February 7th after a return to Knole Park where the "Strawberry Fields" film was taped. Four days later (on February 11th) a brief excerpt of "Penny Lane" was already being shown on BBC's "Juke Box Jury". The British tabloid "News Of The World" publishes an article called "Pop Stars And Drugs - Facts That Will Shock You". In it they claim that most UK Rock Stars were LSD users. After reading that he was reportedly hooked on Benzedrine and hashish, Mick Jagger filed a defamation lawsuit against the paper. Turns out that the reporter who wrote the article had heard Mick's Rolling Stones bandmate Brian Jones admitting to using these drugs but mistook him for Mick Jagger. Exactly one week later, Mick, Keith Richards and Marianne Faithfull were busted for drug possession in London … quite likely as a result of this article. 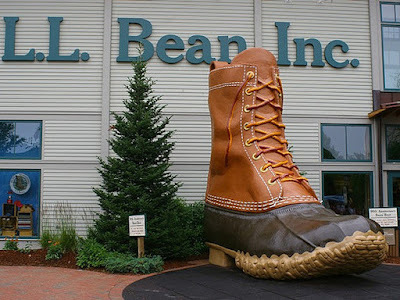 LL Bean died at the age of 94. Leon Leonwood Bean founded the mail-order giant in 1912 by selling a waterproof hunting boot.